Three men were arrested for an incident they had no involvement in when local villagers attempted to block a truck carrying illegally logged wood from passing. Two of the men were shot by Kerom police. On 13 December 2013, Petrus Yahones Tafor, Yulianus Borotian and Wilem Tafor were arrested in Kerom Regency during a police search operation for an incident they were not involved in. The incident involved a group of young men who had been drinking who blocked a truck transporting wood that been illegally logged. The men were protesting the theft of local resources by security forces. Several police officers who were travelling on the truck called for backup from the Kerom district police station. Two hours later, heavily armed police officers arrived in a police truck and two police patrol vehicles and started shooting directly at the group of young men blocking the truck. The group of men threw stones and sticks at the police officers before running away. The clash resulted in the death of one police officer, though reports indicate that the cause of death remains unclear. Police proceeded to search the surrounding area, shooting indiscriminately into houses and causing extensive damage. 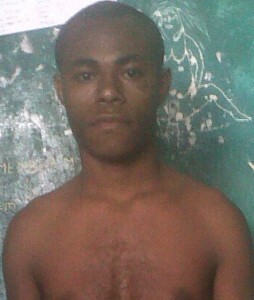 Petrus Yohanes Tafor threw a stone at police who were approaching the home of his brother, Wilem Tafor, to arrest him. Police reacted by shooting him in the hand and the stomach. Both brothers were then arrested. Yulianus Borotian had approached the entrance to his home upon hearing shots, was shot in the neck and lost consciousness. The three men were brought to Kerom regional police station. According to a local source, the three men were not involved in the earlier incident. Petrus Tafor and Yulianus Borotian were later brought to Kerom Hospital to seek treatment for their gunshot wounds, but because of a lack of facilities were then transferred to Bhayangkara Jayapura Hospital. They received medical treatment for a month before they were returned to detention in Kerom regional police station. On 7 February, their case was transferred to the Prosecution. They were charged under Article 170 of the Indonesian Criminal Code for violence against persons or property and were transferred to Abepura prison. Local human rights investigators have voiced concerns that Kerom police fabricated the contents of the police investigation report (Berita Acara Pemeriksaan, BAP) for the case. The three men were sentenced to five months’ imprisonment. On 27 May 2014 Petrus Tafor was released while Yulianus Borotian was released on 19 May 2014 and Wilem Tafor on 4 June 2014.